Well in case you hadn’t heard, the Army/Navy game was last Saturday and for the eleventh straight year, Navy has beaten Army. Now normally this might be considered a big deal in a grudge match rivalry game, but Army was 2/9 on the season and Navy barely got the job done. In fact until just about the 4 minute mark in the fourth quarter Army was in serious contention to win. I’ll even, as a loyal Navy man, say that Navy didn’t win the game as much as Army lost it with that ill timed fumble. Personally, for me the biggest disgrace of the game was not Navy’s poor play or Army’s fumble, it was CBS. Army quarterback Trent Steelman fumbled the ball late in the fourth quarter effectively killing the very real hopes Army had at breaking their losing streak against Navy. Steelman the ONLY Army player in the game to have started all 4 years against Navy was devastated. Once on his sidelines he was inconsolable. I can only imagine how he felt, given that military tradition had him dismissing any thoughts of lost personal glory for breaking the losing streak after so long instead focusing on how he had let his team mates down and how he was going to face them shortly in the locker room. Understandably the kid simply melted down. From that point on every second there was not play on the field the soulless emotionless bastards on the CBS control booth went out of their way to make sure there was a camera broadcasting this poor kid’s misery. Apparently the fact that this quarterback of a 2/9 team made Navy work their butts off and obtain a win more by luck than and gridiron skill shown during the game became irrelevant taking a backseat to the opportunity to gleefully broadcast his personal misery and incessantly comment on it. IS THIS what we have become? A nation of empathy-less rubberneckers reveling in the televised misery of others, who have done their best and fallen short of the extremely high bar they have set for themselves? What’s next ? The All Horrendous Accidents Live Channel? Roman Gladiatorial Games? Maybe this time around we can feed the Terrorist and Muslim fanatics to the Lions. Whatever happen to compassion, professionalism, objectivity and CLASS in Television journalism? Did it die with the changing of the guard at 60 Minutes? WAS it slowly poisoned by people like Geraldo Rivera, Jerry Springer, Dr. Phil and finally die a screaming death with the advent of REALITY TELEVISION??!! SHAME on CBS for focusing their broadcasting on Steelman at that point in the name of ratings and shame even more on those of us who watched. Maybe it really IS time for the world to end if that is what we have become. P. S.: The Patriots rode the Texans all up down the field and tunnels of Gillette Field Monday night like a bronco rider digging his spurs into a mean ride for the full 8 seconds and a final score of 14 to 42. While this makes me very happy it also makes me much despised in Molly’s family. Christmas dinner just got more …complicated since both factions, the Pro Texan Football teams and the Anti Notre Dame haters will be present and greatly riled up over both situations. The bar room was crowded. All of a sudden, the cute little thing on the stool began to cry. Three men and a lesbian were killed along with Impish and Lethal in the rush. have to do, take out full-page newspaper ads?!? Kevin Bacon. It’ll be more like *600* Degrees of Kevin Bacon. will be a lava lamp! Ireland, like most countries, has a number of Christmas traditions that are all of its own. Many of these customs have their roots in the time when the Gaelic culture and religion of the country were being suppressed, and it is perhaps because of that that they have survived into modern times. The placing of a lighted candle in the window of a house on Christmas eve is still practiced today. It has a number of purposes, but primarily it was an symbol of welcome to Mary and Joseph as they traveled looking for shelter. The candle also indicated a safe place for priests to perform mass as, during Penal Times, this was not allowed. 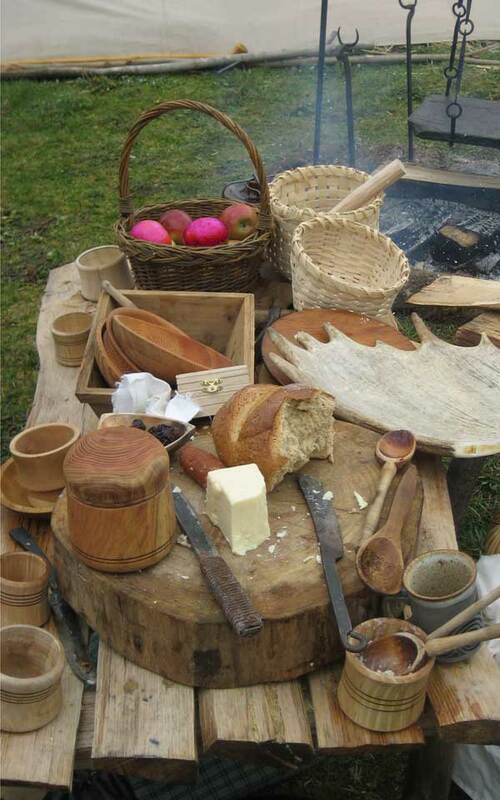 After the evening meal on Christmas Eve, the kitchen table was again set and on it were placed a loaf of bread filled with caraway seeds and raisins, a pitcher of milk, and a large lit candle. The door to the house was left unlatched so that Mary and Joseph, or any wandering traveler, could avail of the welcome. On St. Stephens day, a procession takes place where a pole with a holly bush is carried from house to house and families dress up in old clothes and with blackened faces. In olden times, an actual wren would be killed and placed on top of the pole. This custom has to a large degree disappeared, but the tradition of visiting from house to house on St. Stephens Day has survived and is very much part of Christmas. The placing of a ring of holly on doors originated in Ireland as Holly was one of the main plants that flourished at Christmas time and which gave the poor ample means with which to decorate their dwellings. All decorations are traditionally taken down on Little Christmas (January 6th). and it is considered to be bad luck to take them down beforehand. Speaking of ‘The Laden Table’, lets do a few more holiday recipes for you to get you cheer and goodwill on with. Since Hanukkah also known as the Festival of Lights is currently under way I thought a few traditional non Christmas dishes that can be enjoyed by all would be a good idea as well as more goodies for the baked goods buffet. Better loosen those belts another notch and grab your forks! Total 3 hr. 40 min. Cook: 3 hr. 15 min. 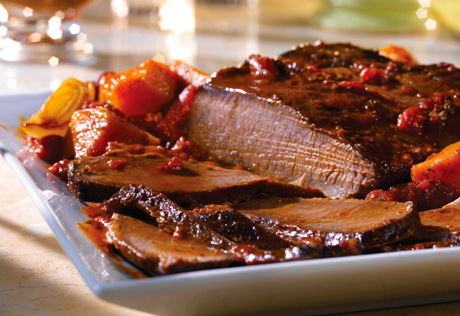 Flavorful brisket, butternut squash and onions slowly simmer in a sweet and savory sauce until the meat is fork-tender and delicious. Heat the oil in an 8-quart saucepot over medium-high heat. Add onions and squash and cook over medium heat until they’re tender-crisp. Remove the vegetables from the saucepot. Season the beef as desired. Increase the heat to medium-high. Add the beef to the saucepot and cook until it’s well browned on all sides. Remove the beef from the saucepot. Pour off any fat. Add the broth, orange juice, wine, brown sugar and tomatoes to the saucepot and heat to a boil. Reduce the heat to low. Return the beef to the saucepot. Cover and cook for 2 hours. Return the vegetables to the saucepot. Cover and cook for 1 hour or until the beef is fork-tender. Remove the beef to a cutting board. Let stand for 10 minutes. Serve the beef with the vegetables and sauce. Head scratch yourself for a minute or two and I’m sure you can see as I do that this recipe will translate well for cooking in a Crockpot while you do other holiday things. Traditional potato pancakes are tastier when they’re served with this creamy mushroom-onion sauce. Place the potatoes into a colander. Rinse with cold water. Blot dry with paper towels. Stir the potatoes, 1/2 cup onions, flour and 1/2 cup soup in a medium bowl. Heat the oil in a 12-inch nonstick skillet over medium-high heat. For each latke, drop 2 tablespoons potato mixture in the skillet, flattening into a 3-inch round with the back of a spoon. Cook the latkes, 5 or 6 at a time, until well browned on both sides. Drain the latkes on paper towels. Stir the sour cream, remaining soup and onions in a small bowl. 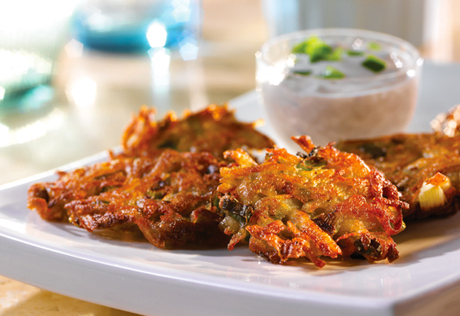 Serve the sour cream mixture with the latkes. HEAT oven to 375°F. Coat baking sheets with no-stick cooking spray. For crust: Finely grind cookies, chopped chocolate, brown sugar, and nutmeg in processor. Add butter and process until crumbs begin to stick together, scraping down bowl occasionally, about 1 minute. Transfer crumbs to 10-inch-diameter springform pan with 3-inch-high sides. Wrap plastic wrap around fingers and press crumb mixture firmly up sides to within 1/2 inch of top edge, then over bottom of pan. For ganache: Bring whipping cream to simmer in large saucepan. Remove from heat; add chocolate and Kahlúa. Whisk until chocolate is melted and ganache is smooth. Pour 2 cups ganache over bottom of crust. Freeze until ganache layer is firm, about 30 minutes. Reserve remaining ganache; cover and let stand at room temperature to use later for creating lattice pattern. For filling: Position rack in middle of oven and preheat to 350°F. Using electric mixer, beat cream cheese and sugar in large bowl until blended. Beat in flour. Stir rum, espresso powder, ground coffee, vanilla, and molasses in small bowl until instant coffee dissolves; beat into cream cheese mixture. Beat in eggs 1 at a time, occasionally scraping down sides of bowl. Pour filling over cold ganache in crust. Place cheesecake on rimmed baking sheet. Bake until top is brown, puffed and cracked at edges, and center 2 inches moves only slightly when pan is gently shaken, about 1 hour 5 minutes. Transfer cheesecake to rack. Cool 15 minutes while preparing topping (top of cheesecake will fall slightly). Maintain oven temperature. For topping: Whisk sour cream, sugar, and vanilla in medium bowl to blend. Pour topping over hot cheesecake, spreading to cover filling completely. Bake until topping is set, about 10 minutes. Transfer cheesecake to rack. Refrigerate hot cheesecake on rack until cool, about 3 hours. Great Britain’s Princess Kate and Prince William are expecting a baby. The bad news: Prince Harry is already planning a huge baby shower in Vegas. Prince William and Kate Middleton are expecting. They don’t know whether it’s going to be a boy or a girl, but they do know one day that child could grow up to be one of the most powerful unemployed people in the world. Prince William and his lovely bride are pregnant. Buckingham Palace announced Kate is pregnant. They’ve been married for a year and a half. That’s like five marriages for a Kardashian. Kate is said to be very nervous about giving birth. Giving birth to a baby wearing a crown is very hard. You can tell the baby’s a member of the royal family, because Kate said she can already feel it waving. A guy goes into the confessional box. He finds on one wall a fully-equipped bar with Guinness on tap. On the other wall is a dazzling array of the finest Cuban cigars. The upholstered chair reclines has massage and heat. Talk about a bad day. A man in Massachusetts was ticketed after being run over by his own pickup truck. Salem police responding to reports of a car accident found Brian Reynolds, 40, lying injured and face down in the road on Monday afternoon, the Boston Herald reported. He told police the brakes in his pickup truck had failed. According to the Salem Patch, Reynolds said he tried to slow the truck by sticking out his foot and driving up a hill. Instead, he fell out of the truck, which rolled over his left leg, according to the Herald. Reynolds suffered only minor injuries, and the truck eventually stopped after hitting a fire hydrant. He was issued a $35 ticket for driving with defective equipment! Ladies, shopping for the guy in your life can be stressful during the holiday season. You have to figure out what the right gift is and then actually manage to find one in all those crowded an unfamiliar guy territory stores. We here at DL/LL Electronic Media Enterprises feel your pain. So in the holiday spirit were going to let you in on the perfect guy’s gift and the easiest place in the world to obtain one with the least hassle possible. TOOLS! It doesn’t matter if it fills a current need or is going to be used with any frequency, guys love getting tools just like women love buying shoes. Hose ‘em Santa! They want to kill us and Christmas! It is my very great privilege and extreme honor to share “A Soldier’s Silent Night” again with you this Christmas. May “A Soldier’s Silent Night” transcend any opinion about this war or any war, and go deeper to foster an appreciation for the selfless sacrifice and courage of The United States soldier and their families. Finally it is my most sorrowfully duty to report than I was informed Monday morning through Military Association channels of the death of a true American hero, a member of the elite SEAL Team 6, those who stormed Osama bin Laden’s compound and served him up a healthy dose of decidedly non Halal American payback and justice for his acts of terror. Petty Officer First Class Nicolas Checque of Monroeville, Pa the 28-year-old SEAL Team 6 member who was in the helicopter assault to free an American doctor from the Taliban, was killed on Dec. 10. On Saturday night, SEAL Team 6 conducted a helicopter assault on a mountain hideout 50 miles from the Pakistani border to rescue Dr. Dilip Joseph, who was captured outside Kabul five days ago. In the resulting firefight, Checque was killed by a single gunshot to the head. Seven of the Taliban, who were armed with machine guns, rocket propelled grenade launchers and AK-47s, were also killed. “He gave his life for his fellow Americans, and he and his teammates remind us once more of the selfless service that allows our nation to stay strong, safe and free,” Mr. Obama said of the fallen American service member in a statement. A spokesman for U.S. forces in Afghanistan said Dr. Joseph, of Colorado Springs, Colo., was rescued early Sunday, local time, in eastern Afghanistan. Joseph, a medical adviser for Colorado Springs-based Morning Star Development, was rescued after intelligence showed he was in imminent danger of injury or possible death, according to the U.S. military. U.S. officials told Martin the Taliban demanded a ransom of $100,000, money Morning Star Development didn’t have. The Taliban released the two Afghans captured along with the doctor, but kept Joseph and were heading south toward Pakistan. The draped casket of 28-year-old SEAL Team 6 member Nicolas Checque is supposed to arrive in the United States tonight. He will be welcomed home with the highest honors.